I discovered this salad in a Cook with M&S promo leaflet I picked up in store. It was the only seasonal dish I could find in it! The best squash to use is Crown Prince, which we have in Camel CSA’s veg boxes this week, but any full-flavoured variety will do. If you can’t get blood oranges, which are in season at this time of year, use other decent ones instead. I’ve also adapted the recipe to include pumpkin or pomegranate seeds, oriental salad leaves or rocket, and parsley or coriander. It’s up to you. Heat oven to 180C/160C fan/gas 4. Put squash, thyme and garlic in a roasting tin and season. Drizzle with 1 tbsp olive oil, then roast for 35-45 minutes. Squeeze the garlic from its skin. Meanwhile put the couscous in a bowl and add 100ml boiling water and set aside for 15 minutes, then fluff with a fork. Peel and slice four of the oranges. Squeeze the juice from the remaining orange, whisk this with the remaining olive oil and season. Stir the pomegranate or pumpkin seeds, salad leaves and parsley into the couscous, reserving some to scatter over. 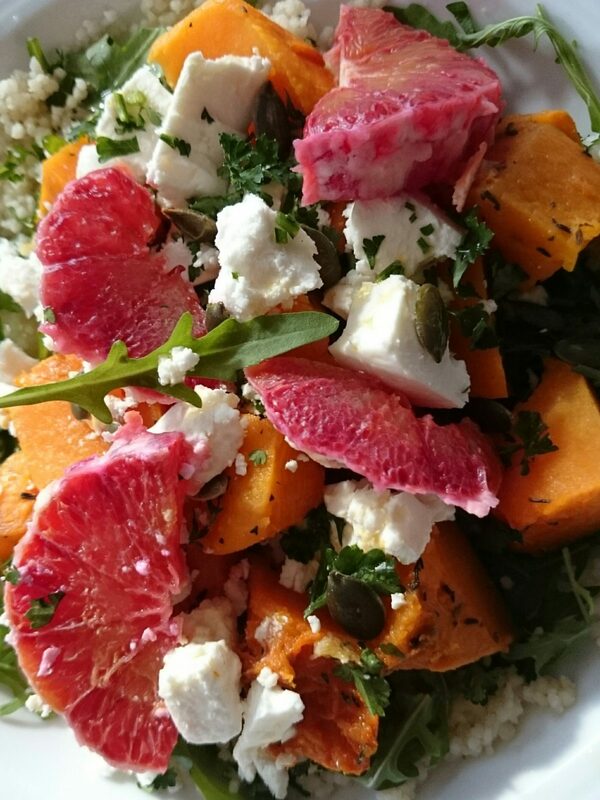 Divide the mixture among six plates and top with the squash, orange slices, feta, seeds, salad and parsley. Drizzle with the dressing and serve.